Babe, Wilbur, Pumba, Larry, Curly, and Mo are Rose Island’s stars. They have full run of our protected wildlife sanctuary and get to spend their days roaming the beaches, going for a swim, and lounging on the sandy shores. In addition to sunscreen and safe sleeping areas, our boys have regular vet check-ups and receive attentive nutritional and skin care. They’ve been living the dream ever since they were piglets and were taken in by Sandy Toes. Our priority is their happiness. Come see for yourself! Tours to Exuma are typically quick stops that allow for only 20 minutes with the pigs before you’re off to another location. On Rose Island, however, you get to play for much longer! As long as the weather is friendly, the boys are out and about and ready for selfies. We even have snacks you can feed them! How much better could it get? If you’re staying on Nassau, Exuma is an astonishing 89 miles away – that’s two hours by boat each way! You’d spend more time on a boat than you would on the island. Rose Island, on the other hand, is a hop, skip and a jump at 6 miles away, or twenty-five minutes by boat. That means you have more time to enjoy the island, the pigs, and your vacation! One thing you may not realize about Exuma’s pigs is that they’re wild. While they are accustomed to humans thanks to their popularity, they are still unpredictable. Larry, Wilbur, Pumba and the rest have been in the care of Sandy Toes since they were babes. They’re as tame as pets and thoroughly enjoy the attention our guests give them! We also maintain a clean environment for the boys and our guests alike, and take the safety of both seriously. 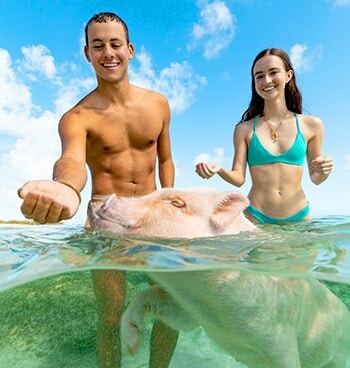 Swimming with the pigs is just one part of the full day excursions we offer! If feeding and taking selfies with adorable animals weren’t enough, you also get to spend your day snorkeling, getting a relaxing massage, enjoying our beach bar, and living the good life on your private island resort! To find out more about our swimming pigs, visit our page here. If you’re ready to book an excursion or want to find out more about the amenities offered at Sandy Toes, head to our information page. Error: Error validating access token: Session has expired on Friday, 12-Apr-19 13:04:57 PDT. The current time is Monday, 22-Apr-19 18:02:29 PDT.